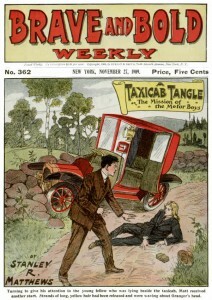 If the Motor Stories series had not ended with its thirty-second volume, #33 would have been Motor Matt’s Mission; or, The Taxicab Tangle, scheduled for release on October 9, 1909. 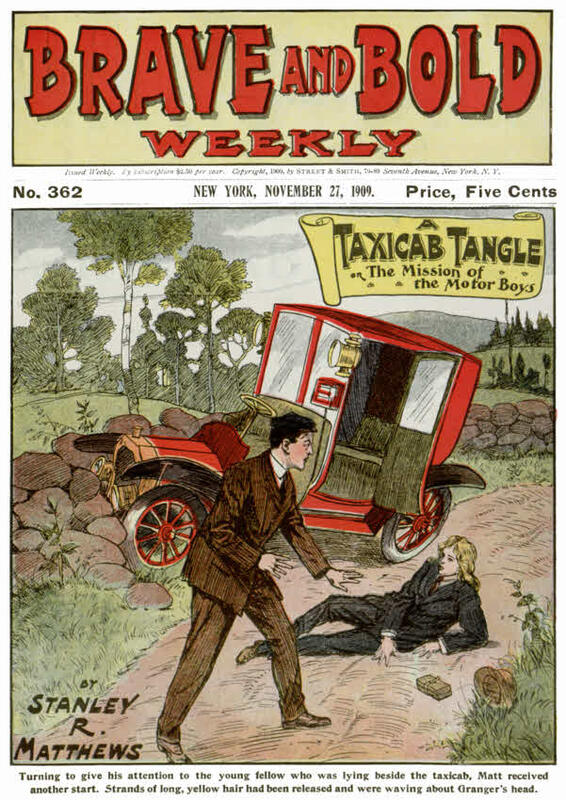 As things worked out, the adventure was retitled and released almost two months later as Brave and Bold #362: A Taxicab Tangle; or, The Mission of the Motor Boys. This story is our latest eBook release, courtesy of Distributed Proofreaders and Project Gutenberg. In A Taxicab Tangle, Motor Matt’s friend Joe McGlory may be in a position to make a large sum of money, but a criminal eavesdropper takes advantage of privileged information to make life very difficult for the Motor Boys. The adventure also includes a minor subplot in which Matt learns of an inventor’s new flying machine, which relies on a new adjustable-buoyancy gas — the closest the series comes to relying on science fiction rather than technological fact. The volume is filled out with the usual eccentric filler material: a tale of a mad dog at sea (probably reprinted from some earlier but unattributed publication), and a personal anecdote about Aboriginal boomerangs (previously published in an 1894 issue of Harper’s Young People). As always, the entire issue may be read online or downloaded through Project Gutenberg.